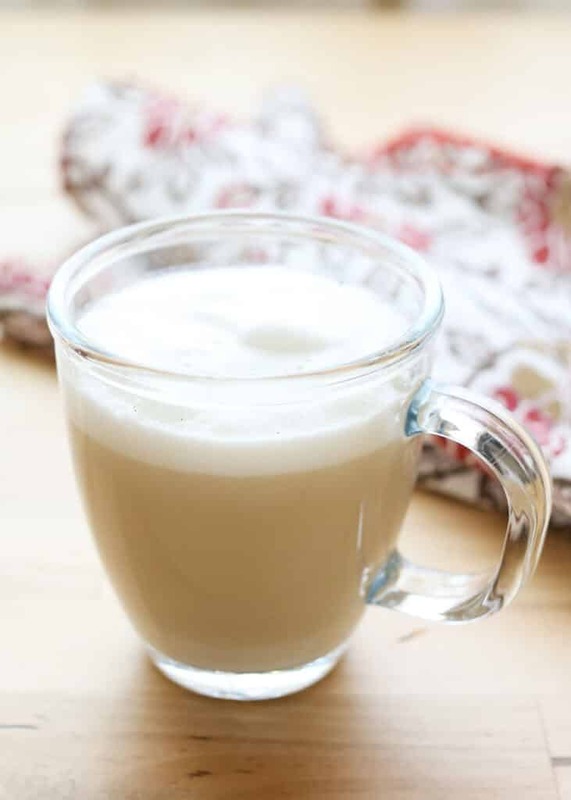 Hot tea is a perfect match for steamed milk in the very popular London Fog drink. I’ve enjoyed my tea with a splash of milk for as long as I can remember. My sister taught me how to make a London Fog while I was visiting her over the holidays. The London Fog is my favorite tea drink these days and I’ve been making this almost every night for two weeks now. This is one of the easiest drinks you will ever make and I promise it is so much more than the sum of the ingredients. I typically use Sweet and Spicy Good Earth Tea for this drink; it is the first tea I have ever enjoyed without adding sweeteners to it. 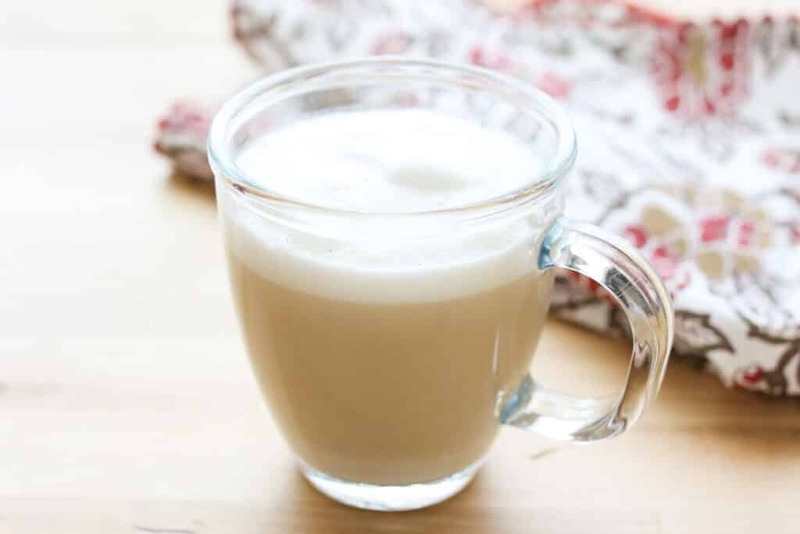 The more traditional London Fog drink is made with Earl Grey Tea and a splash of vanilla syrup. The vanilla takes the very fragrant edge off the Earl Grey and I really like it! This is despite the fact that I’ve sworn hatred for the “perfume-y” Earl Grey for as long as I can remember. It simply works beautifully for this combination of flavors. My favorites aside, you can make a London Fog with any flavor or type of tea that you already love. I buy decaffeinated for both of the teas mentioned here, so that I can enjoy these at night and not wind up wide awake at midnight. If the caffeine doesn’t bother you, or if you are a morning tea drinker, be brave and go for the caffeinated versions as well. However you make it, I hope you love this drink every bit as much as I do! If you don’t already own a milk frother, I can’t recommend one highly enough! I use mine for lattes, frothing milk for cocoa, and for making my beloved Cafe con Leche almost every day. Place the teabag in a mug with boiling water and allow it to steep for 5 minutes. Remove the teabag, add a shot of vanilla syrup and/or sweeten the tea, as desired. While the tea is steeping, heat the milk in a pan or in the microwave until steaming. Use a milk frother for about 15 seconds, until the milk doubles in size and is super foamy. Pour the milk and froth over the hot tea and stir gently. This is one of the easiest drinks you will ever make. Place the teabag in a mug with boiling water and allow it to steep for 5 minutes. Remove the teabag, add a shot of vanilla syrup and/or sweeten the tea, as desired. While the tea is steeping, heat the milk in a pan or in the microwave until steaming. Use a milk frother for about 15 seconds, until the milk doubles in size and is super foamy. Pour the milk and froth over the hot tea and stir gently. Enjoy! Emm.... as an English avid tea drinker (loving Earl Grey) with milk but no sugar or sweeteners I feel strangely drawn to this frothy concoction - must give it a try especially with the vanilla syrup! Chai has become very fashionable here too. Oh my gosh. I have to try this. And now, I simply must get a milk frother! I don't know how I've managed to go this long without one! I'm English, I love tea, and I really can't get my head round this one! I don't even like sugar in my ordinary tea, so to have hot milk and vanilla syrup ...well let's say I am feeling distinctly nauseous! I don't know how well it would go down in London either - where on earth did this originate? Now see, I can certainly understand doing this with coffee - just PLEEEEEEEEASE leave us our tea alone!!! This made me grin, Lynne. Luckily, we can all drink our teas and coffees however we like. 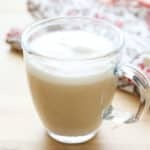 The London Fog is a popular drink right now and you can find many versions of it online, even a full list on wikipedia! Try adding Lavender tea to the mix. Divine!!! Lol, my dad would like that one. This looks yummy recipe. I never try this London Fog before. But I will try this for sure. Thanks for the sharing such a yummy recipe with all of us. I don't have a milk frother being only 14 years o ld, but I love London fog. I've made it before, just couldn't remember how. So I looked up this recipe. I'm gonna have to make some vanilla syrup and try it with that. For now I just use the extract.